Queenstown, New Zealand has made a name for itself as the “Adventure Capital of the World” with a vast array of outdoor adventure activities. Situated on Lake Wakatipu and surrounded by the Southern Alps, you can have brilliantly beautiful clear days or find yourself in a mysterious environment shrouded in mist and rain or low clouds blocking the view of the Remarkables mountain range. What is the perfect exhilarating activity to participate in when the weather isn’t cooperating and you don’t feel like sitting around or as an evening activity? Indoor skydiving at IFLY Queenstown! I haven’t tried jumping out of a plane yet (hopefully sometime this next year though) and was keen to experience the sensation of flight in a controlled, simulated environment. And with the opening of New Zealand’s ONLY indoor skydiving facility at IFLY Queenstown I had the opportunity to do so! 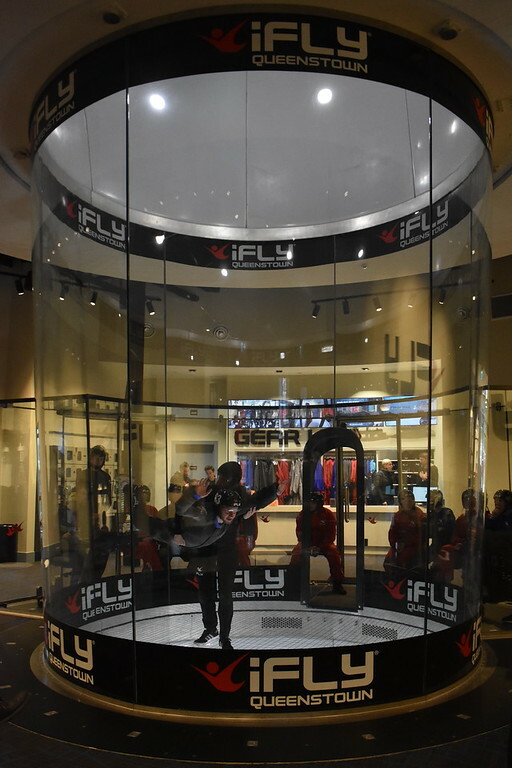 Indoor skydiving involves a vertical wind tunnel in which the air arriving from the bottom of the flight chamber has been compressed and sped up to the terminal velocity (55 m/s) of human freefall. This is done by circulating the air through the fans at the top of the tunnel that pull the air through the flight chamber, push the air down the side tunnels around the chamber and into the bottom of the tunnel where a contractor reduces the space air can occupy thus accelerating the air velocity prior to entering the flight chamber. Indoor skydiving sessions are 60 seconds long each, or the equivalent of skydiving from 15 000 ft and freefalling for 60 seconds! 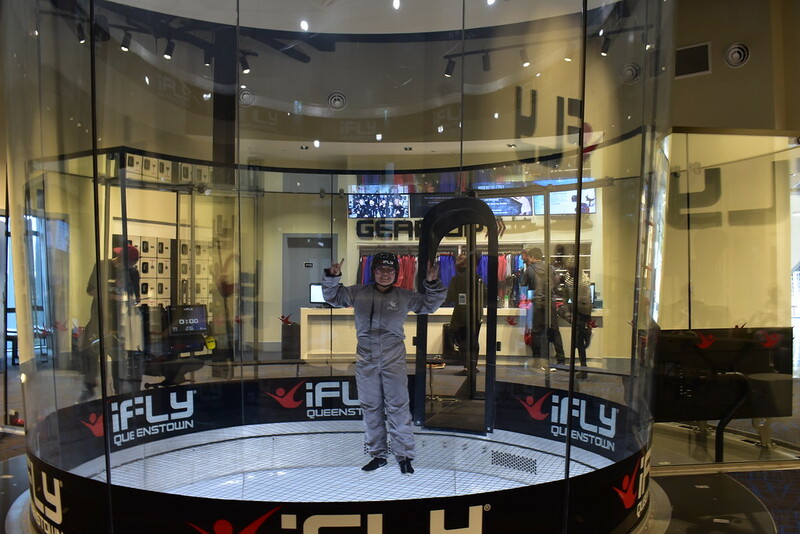 Who can fly with IFLY Queenstown? Almost anyone can fly with IFLY Queenstown. My co-worker’s kids aged 9 and 11 flew and had a blast but they cater to kids as young as 5 years old or up to 105 years old. You can participate as long as you are sober, weigh less than 300 pounds, are not pregnant, are not wearing a hard cast, and have not had your shoulders dislocated in the past as there is a high risk it may occur again and possibly during the indoor skydiving session. People with physical and mental disabilities are also eligible to fly! I booked my IFLY experience at 1pm in the afternoon and arrived at 12pm to check in. You must check in one hour prior to the flight time you have booked. You will have to fill out a safety waiver and receive your wristband. There were 3 others who had booked in my time slot so we watched as the group of 12 before us enter the enclosed glass chamber and sat down on the seating area on the outside the wind tunnel. One by one they entered the wind chamber to practice their body position with an instructor. On their second flight, the flyer was brought to new heights-literally. After a visual of what we were about to experience, we were gathered together to watch a quick instructional and safety video.Our instructor came back for us and went over the proper body positioning in the wind tunnel. It is difficult to talk in the wind tunnel and hand signals would be used instead to communicate whether to straighten or bend legs and arms and encourage looking upwards. Next, we suited up. Loose items were removed and placed in individual lockers free of charge. Suits were slipped into and shoes tied tightly, so as not to lose them in the wind chamber, and helmets with goggles were snugly placed on. After we had our gear on it was our turn to enter the glass chamber. When you enter the wind camber you go in with your arms above your head and simply fall in, landing belly first onto a cushion of air. The instructor firmly held my waist at first as I got my bearing in the tunnel and gradually went down to a hand on my knee. He positioned me towards the controller and I smiled for the camera. My arms were definitely a bit too straight at first and should have been more bent. You can see my instructor attempting to correct my arms at the 39th second in the video below. Soon the blinking lights turned on, indicating the round was almost over. I was brought to the door, grabbed the top of the door with my arms and leaped back into gravity’s arms. After high-fiving my indoor skydiving mates I sat down and watched the last guy in our group have his turn. The second round was even more fun than the first, as we would be going to new heights, quite literally. The first 30 seconds were about getting into body position and used to the air underneath our bodies and we were assisted by the first instructor from round one. The next thirty seconds were taken over by a second instructor who flew us up and down the height of the wind chamber. This was the most fun part and certainly the highlight of my day! The experience at IFLY Queenstown was more enjoyable than I had expected and I would recommend it for anyone nervous about skydiving. It’s less adrenaline focused and more exhilarating than anything. I think this is a great new addition to the New Zealand adventure scene and the staff are keen to make the experience one to remember for everyone. Value wise, consider that one skydive in Queenstown with 60s of freefall (achievable from 15000 ft) would cost 449 NZD whereas at IFLY Queenstown you can experience 120s of simulated freefall for 149 NZD, a difference of 300 NZD! Expect to spend a total of 2 hours at IFLY Queenstown depending on how many people are in your group. Hours are operation are between 9am to 10pm so you will have plenty of time left during the day to explore Queenstown. Indoor skydiving at IFLY Queenstown is also a great option as an evening activity or when the weather could be better for outdoor pursuits. Thanks IFLY Queensown for hosting me. All opinions are my own. Loved the post – super great travel tip! Wondering if you’d like to leave the link to this article on ZenMap. It’s a site that lets travelers click on your link based on where they are looking to travel, so this one would appear in NZ on the map. Leaving the website URL here for you. Thanks for sharing you great tips!